OK, so all of this started with Ira Levin, whom, I am ashamed to say, I have never heard of until very recently. Having checked various websites, I found that although Levin only published seven novels during his time, five of them have been made into movies. He had received two Edgar Awards from the Mystery Writers of America, and was praised by Stephen King as “the Swiss watchmaker of suspense novels, he makes what the rest of us do look like cheap watchmakers in drugstores”. These five novels are A Kiss Before Dying (1953), Rosemary’s Baby (1967), The Stepford Wives (1972), The Boys from Brazil (1976), and Sliver (1991). The most famous of them is perhaps Rosemary’s Baby, as its movie version was chosen as No.9 on the “AFI’s 100 Years…100 Thrills” list in 2001. The movie also started a trend from the late 1960s to the early 1970s of having children and/or teenagers as the protagonists in horror movies. I am further ashamed to say that I have never read Rosemary’s Baby; neither have I seen its movie version. However, I have twice seen The Exorcist (1973), the movie version of William Peter Blatty’s brilliant 1971 novel, and at both times I was so scared I nearly jumped out of my skin. The novel is pretty hard to comprehend, but I still enjoyed reading it. Then it was The Omen (1976), whose novelization of the same title was done by the movie’s scriptwriter David Seltzer. While there was a remake of the movie in 2006, I like Gregory Peck’s performance in the 1976 version way better. Then it was the novel Audrey Rose (1975), which was made into a movie in 1977. The book’s author Frank De Felitta is perhaps more famous in the cinema and theater circles than in the literary arena — he is a producer, scriptwriter and director, and his son, Raymond De Felitta, is also a director. Still, since my reading of Audrey Rose, I have been wondering whether De Felitta’s For the Love of Audrey Rose (1982) and The Entity (1979) are also worth a try. It is Audrey Rose that I want to review in this article. My feeling is this is a book as shockingly brilliant as The Exorcist. While The Exorcist is a bit hard to digest and requires a fair bit of patience to read, Audrey Rose flows really well and is amazingly hard to put down. Reading it made me jump , then become too scared to fall asleep, then find it highly philosophical and demanding a lot of careful thinking, then burst out laughing, then finally begin to cry. Audrey Rose is the story of Elliot Hoover, whose wife and five-year-old daughter Audrey Rose died in a horrific car crash. He thought he had lost all hope for life, but later learned that his daughter has come back to this world and is now living as a different person. Being scientific-minded, Elliot went to India and stayed there for seven years, studying various theories of reincarnation and learning from the lives of the locals. He learned and became convinced that souls learn to improve themselves through many lives, until they are finally able to reach the wisdom and happiness of nirvana. If Audrey Rose had indeed been reincarnated, then it would be his duty as a father and fellow human being to help her seek relief from the pains and sorrows of the mundane world. So Elliot located Bill and Janice Templeton. 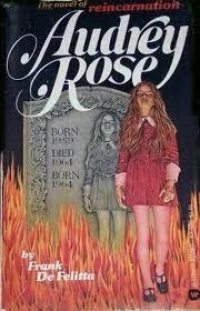 Their eleven-year-old daughter Ivy was born less than two minutes after the death of Audrey Rose, and is now constantly tormented by nightmares, in which she cries and screams and crawls around the room, trying to touch the windows but feeling “burned” by the cold glass. Obviously Bill and Janice did not believe the reincarnation theory claimed by Elliot. However, while Bill called the police in an attempt to refrain Elliot from coming into contact with Ivy, Janice witnessed various episodes of Ivy’s nightmares and how Elliot was able to comfort her by calling her name as “Audrey Rose”, and slowly came to realize that Ivy could indeed be the reincarnation of Elliot’s daughter. It turned out that Audrey Rose was burned to death in the crash, in which she tried to get out of the burning car through the window, but to no avail. This explains why Ivy cries “Daddydaddyhothot” in her nightmares, and they have become so realistic to her that her fingers were blistered after touching the glass. This is a brilliant novel — Ivy’s suffering is horrible, Janice’s struggles as a mother and wife are pitiful, and Bill’s cold-heartedness is resentful. Perhaps Elliott as a character can be interpreted as a test to Bill and Janice’s relationship. It can also be seen as embodying the West’s booming interest in exploring various Oriental philosophies and cultures in the 1960s and 1970s. Still, my feeling is that Audrey Rose can be seen as a book that explores the relationship between the biological parents, the children, and the adoptive parents. I found a feature article on People magazine that was published in April 1976. In this article, De Felitta confessed that Audrey Rose was inspired by his then six-year-old son Raymond, who one day suddenly began playing piano expertly, despite a complete lack of interest and talent in music previously. Raymond claimed that his fingers did the music by themselves. While De Felitta was horrified at the time, he soon began studying theories of reincarnation, and many of his findings were later nicely presented in the novel. One more thing: Throughout my reading I kept thinking Elliot as a character was almost written exactly for Anthony Hopkins, in the same way that Dan Brown was envisioning Harrison Ford as Robert Landon throughout his writing of Angels & Demons and The Da Vinci Code. Since my habit is always to check online the backgrounds of the books I read, I was shocked to find that Elliot in the movie Audrey Rose was indeed played by Hopkins. By then Hopkins was already 40 years old, but he still looked great in the movie. While Audrey Rose as a movie has not done a good job portraying Elliot’s character and life experiences, its presentation of Ivy’s nightmares are pretty good, almost as scary as various scenes in The Exorcist. I strongly recommend that everyone try to have a look at Audrey Rose.